I don't go through products often, but when I do, it's usually a relief or sadness. I'm the type of person, that even if I don't like it, I use it. No product ever goes to waste. Because of that, I have noticed/realized that there are some products I grew fond of, when I actually gave it time to work properly, OR I have disliked a product because it stopped actually working. A bunch of these are new items and some are holy grails. Regardless, I'm going to give you a detailed review of each and tell you why you need them, or can skip out, if you were thinking of getting it. Derma E Shampoo - This is my holy grail shampoo, I also use the conditioner, but the shampoo I go through quicker. I have a very dry scalp...I don't have dandruff luckily, but my scalp gets extremely itching and ends up flaking under my nails. I know I'm not the only one that struggles with this, so hopefully this recommendation helps someone. Since using this shampoo, I haven't had that issue. My scalp is actually rarely itchy, and when it is, it's because it's time to wash my hair. I only wash it once a week...I used to wash it 2/3 times. I know that hot water dries the scalp even more, so why do more damage and harm? Yes To Cucumber Wipes - Another ride or die product. Now, I do give other wipes a fair chance, and trust me, there have been so many, but nothing compares to these. I know a lot of people have complained that these burn their eyes and irritate their skin, but for someone who has sensitive skin, none of that happens to me. These remove my makeup completely off, and don't leave an oily or greasy feel behind. I don't mind the smell, I actually like it. Nothing has come close to how well these work for me. S.W. Basics Exfoliant - This took me FOREVER to get through, but it's because I was rotating through another exfoliant It was my first time using this product and at first I didn't like it at all. This is one of those instances where you don't like something and then out of nowhere, it ends up really surprising you. The fact that this only has 3 ingredients, is what continues to impress me. I think the oat flour is what turned me off, but as I continued using it, I realized how it wasn't a rough exfoliant and that's what I need, now that my skin is clear. The salt does burn a little if you have an open pimple/wound, just a side note. S.W. Basics Serum - The day I ran out of this, was a really really really sad day. If you have followed me on IG, Snap or even read my post on what I brought to Portugal this summer, you will know this is my FAVORITE S.W. Basics product. I bought this November of 2015, and it lasted me until the very end of September. I used it EVERY night, 3 drops, for a year and the magic that happened, is yet to be seen by another brand. Whenever people say skincare is expensive, it's 1. because it lasts long, since you use less, and 2. worth every penny. Yes, I could make this serum myself, since it's minimal ingredients, but I love supporting this brand and will be buying this again, once my new serum ends. Argan Republic Youth Elixir - I received this as a part of a subscription box from the brand itself. I was curious about the brand for a while and figured this would be the best way to test it out. The Youth Elixir has rave reviews, and since I had just finished my S.W. Basics serum, I thought this might be a good replacement. Unfortunately, it didn't do well with me. I saw no difference in my skin, and I actually felt it was less hydrated with all these oils, compared to the S.W. Basics one, which has 1/8 of the ingredients. Maybe I'm spoiled by the S.W. Basics one, that I won't be able to really give this a fair review, or maybe it just didn't work well with me. I guess I'll never really know. Argan Republic Rooibos & Hibiscus Toner - This was a part of November's subscription box, that last box I'm receiving from this brand, sadly. Maybe it's just not the right brand for me. The toner smells lovely, and it seemed hydrating...but again, I didn't see any noticeable differences, and often went back to the toners I was using previously. To be fair, toners are difficult, and I wish this came in a bigger tester, so that people can give it a fair shot. I think it may be too many ingredients for my skin and it either reacts in break outs, or does nothing. I honestly don't want to discourage someone from trying this, just be sure to get a good amount to try out, before coming to a conclusion. Osea Ocean Lotion - Again, if you've been following me for a while, you know that Osea has become one of my favorite brands this year. I just love this product so much, along with the toner, which I ran out of, but I'm reusing the bottle. This lotion was seriously the best skincare product this summer. This mattified my skin, while hydrating it at the same time. This pretty much works perfect as a face primer for makeup. Regardless if you have oily or dry skin, this is a lotion I highly encourage everyone try. I got the small travel size bottle to try it out, but once I'm done with a bunch of other skincare I have, and use the other trial size bottle I have, I'm picking this up in a full size. Trust me, you need it. Affiliate link to the right, takes you straight to their website. Baroness X Vegan Jelly Soap - I was lucky enough to receive a lovely package from Demi from Baroness X, to try out products. She's going to be featured in a future Meet The Maker and kindly sent things for me to try. Up until this package, I had only tried/owned a polish from her. I knew she did vegan bath and lotions stuff, but hadn't made a purchase yet. This was my first time trying jelly soap, I know Lush makes them, but I've never really understand them. Well, my thoughts on this are as follows; loved the smell, hate the texture, felt clean, wouldn't buy again. As much as I loved the smell and the way it cleaned, I hated that the jelly consistancy broke apart so quickly in the shower. I feel like I lost more product, than I actually used. Maybe it's because it's vegan and doesn't hold together as well? Wet N Wild Brow Mascara - Another product I swore by this year, and yes, I already have a back up. Honestly, I never thought I'd become such a snob with my eyebrows, but because of this now, I can't go without it. It tames my brows, gives it enough fill, and holds them in place so well. It doesn't feel crunchy, and I can even comb through it, with no hassle. I LOVE THIS SO MUCH. I have already got a couple of people into this as well, and they thank me for the recommendation, but honestly I thank Wet N Wild for creating such an amazing product. I hope they never get rid of this. Urban Decay Perversion Mascara - I've been an avid fan of UD for years. I own a bunch of their stuff, and prior to them selling out, I always recommended them. Unfortunately, they are now owned by L'Oreal and I don't buy their products, but if gifted, I still use. With that said, if you are someone who buys and supports a brand, regardless of their parent company, then you need this mascara. It's hands down my favorite. Gives my lashes so much volume and length. Doesn't clump, and doesn't irritate my eyes. I LOVE the applicator as well. I tend to let this dry out a bit once it's open, I do this with all my mascara's, and it works so well. Worth the money, to be honest. 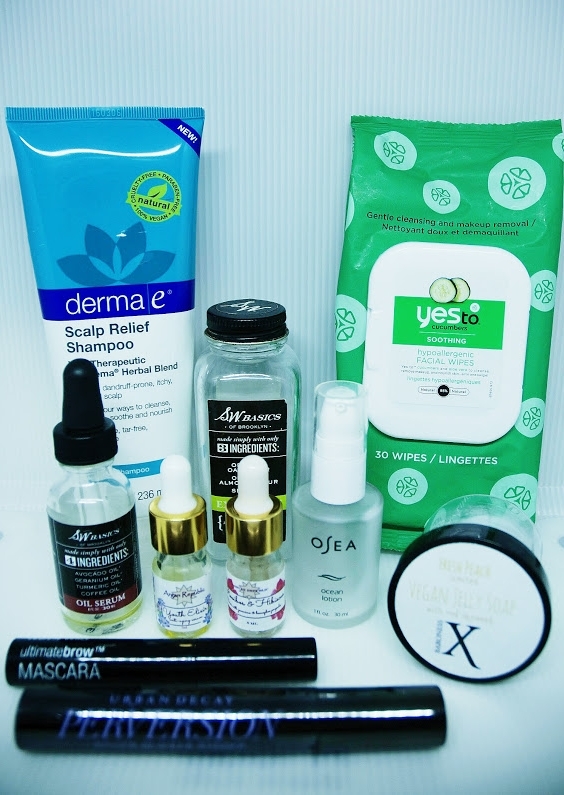 So there you have it, a bunch of empties and my thoughts on the products. I also used up a BUNCH of handmade soaps from Tarabusi Creek, Apoterra Skincare, Aroma Rebel, and Wild Rituals Soap Co, but I don't save the wrappers. With that said, I LOVE the Zen Soap from Wild Rituals Soap Co so so so so much, it's definitely my favorite soap of the year. Tarabusi Creek has also become my favorite brand, because the mixture of smells she puts together, are amazing. Also, the soaps are really hydrating. What have been some of your empties this month? Also, have you tried any of these products? If so, thoughts?